Looking for a kid-friendly recipe? Of course, serving good food to kids is no less than an exercise. Probably everyone finds it challenging, so do you. But did you know there are ways to sneak in healthy goodness to your tiny tots? I am quite familiar with childish pranks. I have seen my nephew and niece indulge in finding escape routes from whatever is served on their platter. But my one-and-a-half year-old niece loves to indulge in my simple cookie recipes. She is my sweetheart- bhua's paro! This sattu cookie recipe is dedicated to my Paro. I love to experiment with healthy cookie recipes for Paro darling. This is one simple cookie recipe that you can prepare in an instant. It requires no fancy tools, nor any expensive equipment. Of course, all you need is sattu or roasted gram dal powder and oatmeal. If you wish to make these sugarfree cookies, then you should have jaggery handy. Else, we can prepare sattu cookies with raw cane sugar. I am no longer buying white sugar, so all of my recipes would be sugarfree from now. But that does not make all of these recipes diabetes friendly, please keep this in mind. Whether you have an oven or microwave convection or an airfryer or even a stovetop, you can prepare this simple cookie recipe in a jiffy. Making these healthy airfryer cookies is all about gathering the ingredients, sifting the flours, whipping up the wet ingredients, mixing with hands, and rolling out into lime-sized balls before putting the cookies in the oven. It's a good source of insoluble fiber. This means it is good for your intestines. Sattu is low in glycemic index, which means it does not cause any blood glucose spike.It is a safe addition for diabetics for this reason. But this cookie recipe is not diabetic friendly. However, there are many diabetes-friendly recipes in this blog. You will also love some of the best diet food recipes here. Additionally, roasted gram is a rich source of iron, magnesium, and manganese, which makes it a handy addition to your diet. On top of it, sattu is low in sodium, so it is a healthy option for those with blood pressure issues. Sattu drink for summers - it acts as a coolant! Sattu roti - mix with whole wheat flour, oatmeal, and methi dana to make diabetes friendly flour. Sattu parantha- mixed with onions and methi- there are numerous variations! Okay so lets come back to the sattu maavu cookie recipe, though this does not have all the ingredients to be classifed as sattu maavu! The best thing about this no baking powder cookie recipe in an airfryer is that you can vary the proportions to suit the taste preferences of your family. Whisk ghee, olive oil, raw cane sugar, and milk until fluffy. Take a sieve and sift sattu, oatmeal. Add dry roasted sesame seeds. Mix everything with hands. DO NOT KNEAD. Keep the dough as is covered for 30 minutes. This will allow the flours to absorb the moisture on their own rather than you forcing the same into them. After half an hour, the dough should have hardened a bit. If it is difficult to roll and looks too hard, add 1 tsp of milk and gather the ingredients. Roll into a thick chapati or make lime sized balls and use a fork to make insertions. Preheat oven or microwave convection at 170 degrees for 10 mts. 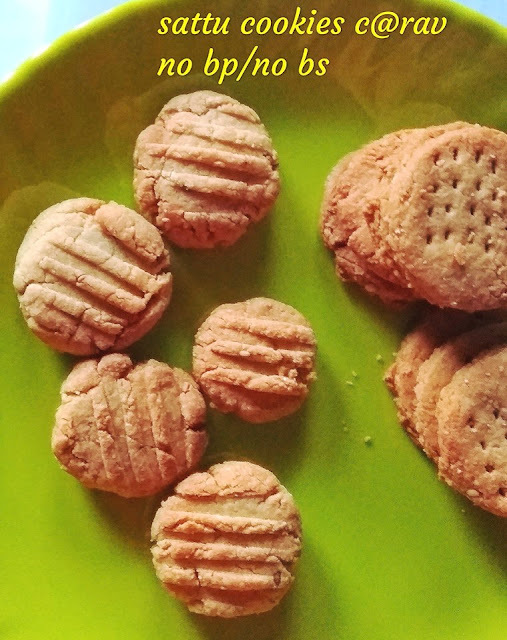 I baked sattu cookies in the airfryer. Preheat the airfryer for 3 mins. Temperature settings vary from oven to oven, so keep an eye on your kid-friendly cookies and bake them little longer if they look unbaked. But do not brown these too much. Allow the sattu cookies to cool down completely on a cooling rack or wire mesh outside the oven/airfryer before munching on them. These cookies should be done rather quickly. Enjoy melt-in-the-mouth cookies for kids and elders alike. Isn't it simple to bake a batch of deliciousness? Now, do you still wonder how to make oatmeal delicious? If so, do not forget to check our ever-growing list of oatmeal recipes here. We have more than 100+ oats recipes. The sattu cookies look so good Ravneet..healthy and tasty treats ! Hi looks great n healthy recipe.What is sattu in English ? Is it uradh dhal ? Thank you. Sattu is roasted Bengal gram/ roasted black gram. These turned out very good. Thank you! I added 2 tbsp cocoa to it as well :-) Would love to try vegan version though.